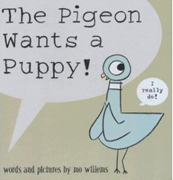 ﻿ Sonderbooks Book Review of The Pigeon Wants a Puppy! Hyperion Books for Children, New York, 2008. That wonderfully persuasive, pleading (well, demanding) Pigeon is back! This time -- could it be? -- it looks like he will get what he wants! But it doesn't turn out quite like he planned. As always, it's truly amazing how much emotion Mo Willems can convey with a few simple cartoon lines. The Pigeon bends his knee winsomely when he thinks of what he wants. He narrows his eyes when he says, "You don't want me to be happy, do you?" I've gotten to test this out on a few kids, and the inevitable reaction is, "Read it again!" You've gotta love the Pigeon!